If you want applications to be collected in the Accountingfly ATS you need to enter your email address into the Application Email/URL field on the Post a Job page. This is the page where you enter the details of the job posting. You must enter something in this field. Enter an email to collect applications on Accountingfly and have them also emailed to you, or enter an URL and direct applicants to your own ATS. To access your jobs you will need to login. 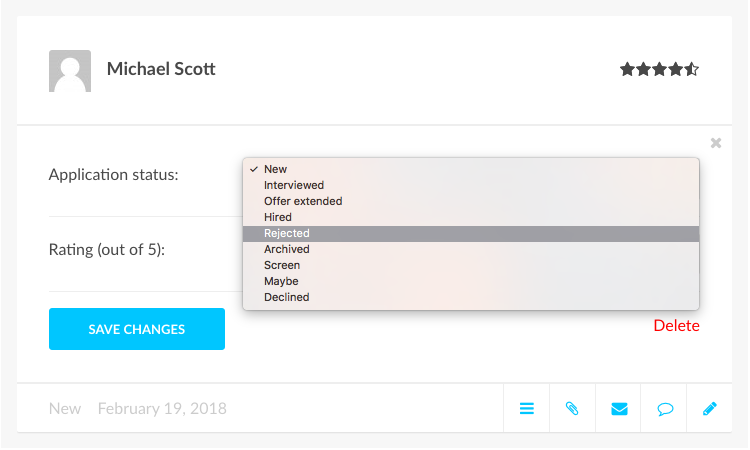 Once logged-in you should automatically be redirected to My Dashboard which will list all of your jobs both active and expired. To access Applications, click on the number under the Applications column. This will now display all of the applicant cards for the selected job. Menu – Contains the cover letter, public experience indicator, and work eligibility of the candidate. Paperclip – Opens the resume of the candidate. Envelope – Opens a new email in your default mail application. It will auto-fill the new email with a subject and introduction. Chat Bubble – Opens a Notes function allowing you to view past notes and create new ones. Pencil – Allows you to edit the applicant status and ranking of a candidate. Every candidate can be assigned to an application status. To assign a candidate to a status, click on the pencil icon on their applicant card, select the desired status and click Save Changes. To view all candidates in a particular status, click the Filter by Status dropdown menu at the top of the Applications list and select the desired status.